The State of São Paulo exported US$ 45.5 billion in 2015, accounting for 24% of all Brazilian exports. Some 38% of this value was generated by 15 products, namely: sugar (from cane and sucrose), aircraft, automobiles, pure alcohol, boneless beef, orange juice and coffee beans. The data were published by the Ministry of Development, Industry and Foreign Trade (MDIC-2015). Of the total number of exports, 19.6% went to the Mercosul trade block, 13.7% to the European Union, 33.2% to the Latin American Integration Association (Aladi) and 22.4% was to North America Free Trade Area (NAFTA). For Asia, excluding Middle East, it is destined 16.4% of such products. Finally, among the main buyers, the following countries stand out: the United States (17.6%) and Argentina (13.1%). The State's importance for the global manufactured goods market is also evidenced by the import statistics: 39.5% of externally manufactured goods are purchased by the State of São Paulo. 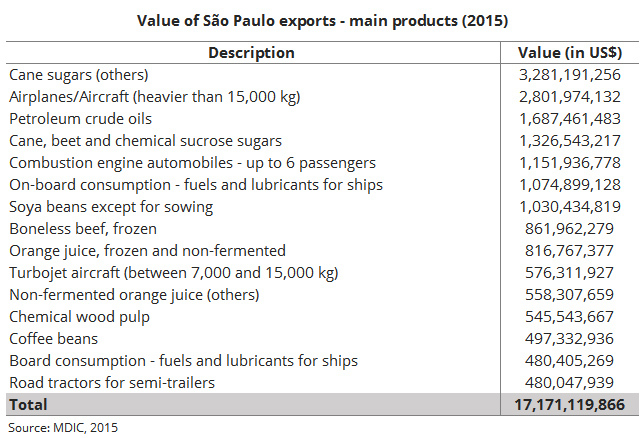 São Paulo accounts for 25.9% of all basic products imported by Brazil. The USA is the main external supplier to the state of São Paulo, representing 18.0% of imports, followed by countries like China (17.2%) and Germany (8.5%). Find out more about some of São Paulo's main economic sectors.